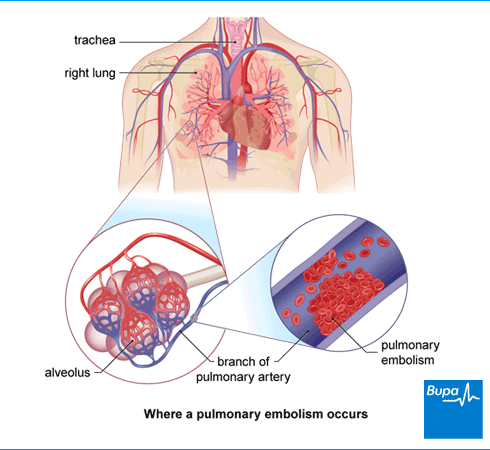 A pulmonary embolism is a blockage of a blood vessel in your lungs. Most of the time, the blockage is caused by a blood clot or part of one. These clots often develop in your legs (a deep vein thrombosis or DVT). A piece of the clot in your leg can break off and travel through your body in your bloodstream until it gets to your lungs, where it gets stuck. If blood isn’t flowing through your lungs properly, it can be very serious. Getting treatment quickly can be life-saving. When you have a pulmonary embolism, the symptoms can sometimes be vague and nagging for several weeks, or they can be sudden and severe. Some people have few, if any, symptoms. This can sometimes make it hard for doctors to diagnose. The symptoms you have and how severe they are will depend on how big the pulmonary embolism is and where it is. For example, if the clot is small and in a blood vessel at the outer edge of your lungs, you may have mild symptoms. If the blood clot is large and in a central blood vessel, it could cause you to collapse suddenly. These symptoms could be caused by conditions other than a pulmonary embolism, but if you have any of them, see your GP as soon as possible. If you have severe symptoms, including difficulty breathing and chest pain, you should call an ambulance and get medical help as soon as you can. Many people with a pulmonary embolism get it while they’re already in hospital for something else, such as an operation. Or, if your GP suspects you may have a pulmonary embolism, they’ll arrange for you to go to hospital straight away. At hospital, you may have the following tests. Computed tomography pulmonary angiogram (CTPA). This is a CT scan where you have dye injected into your veins so that they show up on the X-ray image. Isotope lung scanning (also called ventilation-perfusion or V/Q scanning). This test is used if you’re pregnant, have kidney problems or can’t have a CTPA. It shows how much blood is getting into your lungs. A blood test called D-dimer. If the test result is negative, this may help to rule out DVT and a pulmonary embolism. A leg vein ultrasound. This uses sound waves to look at your blood as it flows through the blood vessels in your legs. Your doctor may do other tests such as a chest X-ray and blood tests, to confirm whether you have a pulmonary embolism or another condition. If you have a pulmonary embolism, it’s important that it’s treated quickly. This means that you’ll usually begin treatment while you’re waiting confirmation of your diagnosis. You’ll usually need to be admitted to hospital, if you’re not already in hospital. You’ll be given oxygen to help you breathe, and fluid through a drip if necessary. The main treatment for pulmonary embolism is a type of medicine called an anticoagulant. Anticoagulants prevent blood clots forming or stop blood clots getting bigger. You may also need treatment to get rid of the existing clot (see next section for more details). Which type of anticoagulant your doctor recommends will depend on your general health and what caused your blood clot, as well as local guidelines and your doctor’s own experience. One of the first options is often a group of medicines called novel anticoagulants (NOACs). These include rivaroxaban, dabigatran, apixaban and edoxaban. These medicines have the advantage that you don’t need heparin injections with them, and you don’t need to be monitored as closely as with older anticoagulants. If you’re unable to have treatment with an NOAC for any reason, you’ll usually be offered treatment with low-molecular weight heparin (LMWH) and warfarin. LMWH is given as an injection under your skin, while warfarin is taken as tablets. You’ll need to have both treatments to begin with, because it takes a few days for the warfarin to start to work. You’ll be able to stop the LMWH after around 5 days. But you’ll probably need to continue taking the warfarin tablets for three to six months, sometimes longer. If you have kidney failure or you’re at high risk of bleeding, you may need treatment with another type of heparin – called unfractionated heparin. You’ll need to have regular blood tests if you’re taking warfarin, to make sure your blood is clotting properly. This is called an INR test. You won’t need to be monitored in this way if you’re taking an NOAC. If you’re taking an anticoagulant, your nurse or doctor should give you an alert card, which you should always carry with you. If you’re taking warfarin, you should also be given an anticoagulant information booklet. Depending on your medical history and why you developed a pulmonary embolism, your doctor may recommend you continue taking anticoagulants for the long term. This is to prevent any more blood clots developing. If your doctor thinks you have a life-threatening pulmonary embolism, you’ll need treatment to remove it. You may be given a type of medicine called a thrombolytic. These help to dissolve new blood clots. An example of a thrombolytic medicine is alteplase. If you need treatment very quickly or other treatments haven’t worked or can’t be used, your doctor may suggest an operation to remove the blood clot. This is called an embolectomy. There are several different procedures for this. You can have open surgery, where the clot is taken out by making a cut in the blood vessel. Or you can have an embolectomy using a catheter. This is when a thin tube is placed inside your vein and moved to where the clot is. Your surgeon can then break up the clot via the catheter and remove it either by using special instruments or with suction. Most people with DVT can have treatment with anticoagulants. But if you can’t or you’re at high risk of another pulmonary embolism, your doctor may suggest you try an inferior vena cava (IVC) filter. An IVC filter is a small metal device placed inside a vein to trap any clots before they can travel to your heart and lungs. These filters are usually temporary. Most pulmonary embolisms come from a deep vein thrombosis (DVT). This is a blood clot in your leg or your pelvis. If the blood clot moves or bits of it break off and travel to your lungs, it’s called a pulmonary embolism. If you're in hospital for a big operation or because of illness, you may be more likely to develop a deep vein thrombosis or a pulmonary embolism. When you’re in hospital, your nurse or doctor will measure your risk of developing a blood clot. You may be asked to do the following. Drink plenty of fluids. If you can’t drink, you’ll be given fluids through a drip. Get up and start moving about as soon as you can after an operation or illness. Wear compression stockings to help your circulation. Use an intermittent pneumatic compression device. This is an inflatable cuff wrapped around your leg or foot and an electrical pump that inflates it, squeezing your deep veins. Have anticoagulant medicines such as heparin. You can also prevent blood clots from developing when you’re sitting down a lot during a long journey. You can find out more about this in the FAQ on flying. You’re four or five times more likely to develop a blood clot when you're pregnant than when you’re not. You also have a greater chance of having a pulmonary embolism just after you’ve had your baby, especially if you’ve had a caesarean section. If your doctor thinks you're at high risk of getting a blood clot, they may offer you heparin injections while you’re pregnant. You may need to take anticoagulant medicines for six weeks after you have your baby. Could anticoagulants harm my unborn baby? Could anticoagulants harm my unborn baby? There are some anticoagulants (medicines that prevent your blood clotting) that can harm a developing baby, so you shouldn't take these when you're pregnant. This includes warfarin and other newer anticoagulant tablets. If you’re taking warfarin, or other anticoagulant tablets, and think that you might be pregnant, tell your doctor immediately. Heparin is safe to take when you’re pregnant because it doesn’t pass from you to your baby. Talk to your doctor for more information. Does the pill increase my risk of pulmonary embolism? Does the pill increase my risk of pulmonary embolism? The likelihood of developing a pulmonary embolism if you’re a young woman is very small. The chances of getting one if you’re taking the pill are also very small, but they are greater than if you’re not taking it. However, you’re less likely to get a pulmonary embolism if you’re taking the pill, than you are if you’re pregnant. There are other things that increase your chances of getting a pulmonary embolism. These include your age, whether or not you’re overweight and if you have a family history of blood clots. Your doctor will discuss this before prescribing the contraceptive pill and may suggest other types of contraception for you. Do long flights increase my risk of pulmonary embolism? Do long flights increase my risk of pulmonary embolism? If you travel long distances, and spend hours sitting down, then you could be more likely to develop a blood clot in your leg (deep vein thrombosis, DVT). A DVT can then lead to a pulmonary embolism. However, the chances of this happening are very small. Sitting down on a long journey means that your legs are inactive and the flow of blood through them slows down. This can make it more likely that a blood clot will develop in your leg and may then travel to your lungs (pulmonary embolism). All long-distance travel (plane, car, coach or train) increases your risk of a pulmonary embolism by about three times, but the risk is still small. For example, for flights that last 16 hours or more, there will be one person who develops a DVT or pulmonary embolism every 1200 flights. The longer the journey, the greater your chances of getting a blood clot. People who get a DVT or pulmonary embolism after a long journey often have other health conditions or risk factors too. These include having had a previous blood clot, being very overweight or having recently had surgery. You may also be more likely to develop a blood clot if you’re pregnant. There are some simple steps you can take to reduce your chances of getting a blood clot when you’re flying. Get up and walk around whenever you can. Do leg exercises in your seat; for example, bend and straighten your knees, feet and toes every half hour. Drink enough water so you don’t become dehydrated. If you’ve had recent surgery, have had a blood clot before or have other health problems that make developing a clot more likely, speak to your GP. They may suggest you wear compression stockings while travelling. These are tight stockings for your lower legs to help your blood to flow properly. If you develop a painful and swollen leg or any breathing problems after a long journey, get medical advice as soon as you can.